I wrote this back in April the 3rd as a draft. Now I am publishing it. Where do I begin? I mean, I could write a thing or two about what I learned from participating in Heart Jam and the development of Pizza Extreme. But I think I need to give some contexts behind the making of the game first. I know this post-mortem is very much overdue. I should’ve written this few days right after I submitted my game to the jam. 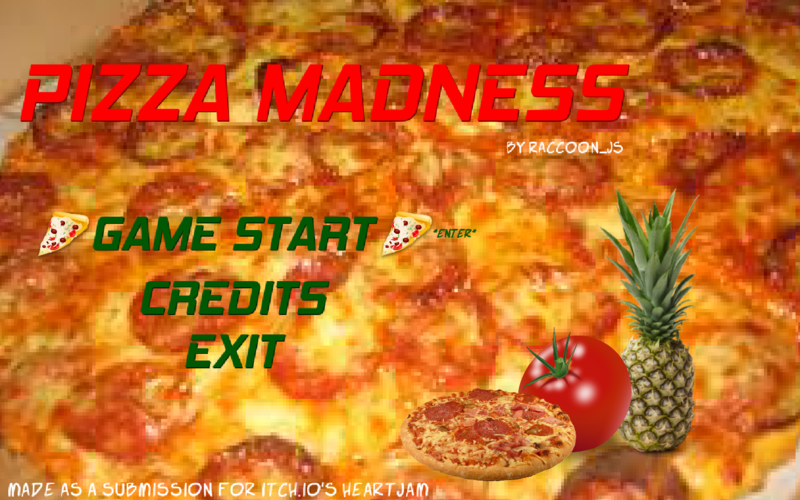 While I had some thoughts in my mind during the development of Pizza Madness, but most of them were gone like ashes. However, I could bring those ashes and turn them into some kind of ornamental objects, so I will try my best to remember them back as much as I can. I started following HeartBeast’s YouTube channel right after I downloaded GameMakerStudio 2 and learned how to make platformer game with the engine. After I made my own first game with the engine, I tried to publish it but I faced a frustrating error along the way. This error that the compiled execution file couldn’t find the game almost made me quit making games. However, I downloaded Godot 3 engine and start using it, which brought back my interest in designing games. It was a miracle. A week later, HeartBeast announced that he will host his first Game Jam on itch.io. I felt mixed about his Game Jam, but I made up my mind so I signed up itch.io and joined. Around that time, I was teaching myself how to make Asteroid-like game with Godot 3 engine. Then I thought I could make a game out of Asteroid-like prototype that I built. (This would explains why Pizza Madness felt like Asteroid due to its tank control and tomatoes multiplying). As the Heart Jam began, I took a word ‘pizza’ from words generator I built and made a scarcity-themed game out of it. While making this, I had no story or concept in my mind. I just made it up as I go along. I think when I was like 25% finished, I realized I could make game that’s intentionally trashy for the sake of being trashy. You know, something you could play and make an ironic enjoyment out of it. That’s why the main plot of this game sounds so B-movie like and completely nonsensical. And as a result, I received some criticisms about how my game is rather unplayable and unpleasant to look at. My personal favorite criticisms I got was from Zen00 and Somnivore, where they both list out in details about what’s wrong with the game, from controls to graphic. I responded them back by thanking them for providing feedbacks. And now, the postmortem. An overdue postmortem. The main reason I participated in Heart Jam because it would provide me a motivation to keep making games. And it did motivated to make games, but I learned an obvious lesson that people want polished games rather than joke games - even if it’s made less than 72 hours. I didn’t polish too much before the submission which explains why I got some harsh criticisms. But good thing about getting feedbacks is that you could learn many lessons from them and try to improve yourself in the future. Another great thing about the participation was that I got to know more about Godot 3 better than before. Maybe “joke games” could work, but no many people will get it. And labeling it as a “joke game” may not be a good excuse for the game’s faulty controls. Keyboard control-only is not preferable. You could make a prototype game, but don’t model on it too often. Try spend more time fixing the game right before the submission. And people prefer Windows more. That’s all I could think of right now.